Many householders have turned to composting for environmental reasons in an attempted to reduce waste sent to landfill and the consequential production or harmful “greenhouse” gases. These composters will be looking for a way to deal with garden and uncooked kitchen waste but also wish to compost cooked food waste. Which until recently was being sent to landfill but is now often collected separately by local councils and converted by anaerobic digestion to gas which can be used to provide heat and power. Traditionally home composting was the preserve of gardeners who made compost because they wanted to improve their gardens and the yield or appearance of the plants they grow. However being a cynic, I feel that often gardeners turned to composting as a means of dealing with the waste from the garden and because it was, free. This more cynical approach might explain the neglected heaps of vegetable waste or wet and smelly grass cuttings lurking in the corners of many gardens. If done properly composting provides a means improving the soil, providing a supply of food for the growing plants and helping maintain effective drainage and moisture retention. Plants require three main elements. Oxygen and carbon are obtained by photosynthesis from the air but hydrogen together essential nutrients, such as nitrogen, phosphorus, potassium comes from the water in the soil. The soil also provides a means of supporting the plant and allowing the roots to spread. The chemicals in the soil determine its pH. The texture or the soil determines the amount of air contained within it that determines in part whether the soil is easily waterlogged. The texture is determined by that part of that soil consists of inorganic particles of what were rock fragments and minerals. The texture of the soil is classified depending on the sizes of these as gravel (particles over 2mm), sand (particles 0.02 -2mm), silt (0.002mm-0.02mm) or clay (Smaller than 0.002mm). While the inorganic part of the soil is important to the plant the texture can be improved by the addition of compost, a process that that the composter directly influence. Organic matter is anything that has lived or is living in the soil; it consists for the most part of partly decayed plant material e.g. leaves, twigs and the remains of animal material. Peat and other organic soils can contain between 20% and a massive 95% organic matter. Humus contains high levels of nutrients and beneficial microorganisms. It can is also very effective at retaining moisture (up to 80 to 90% of its own weight). Where climate change results in dryer conditions, this might become increasingly important. increasing the soil's capacity to withstand drought. The structure of humus enables it to act as a buffer against soils that are too alkaline or acidic, and the dark colour even helps to warm up cold soil in the spring. Think of Humus as the topsoil, built up gradually over years in woodlands, which makes a nutritious material for planting and for soil treatment such as improving drainage on clay soils ( I originated from the Sussex so am familiar with the joys of a clay soil). However, we should no longer raid the local woods, either personally or by getting a garden suppler to do it for us, and as composters we are lucky that humus is only mature compost made by nature and we can speed up the process at home. The key word is mature and most compost is not matured. If you want to produce Humus at home, the composting process must be allowed to finish and complete the maturation process. Most of us will not wait although we may allow the compost to mature for a month or two and are happy to use compost rather than Humus. The compost is best added as a mulch and left for the worms to take it down into the soil without destroying soil structure. Most gardeners will be familiar with peat compost sold by most Garden Centres but may not be aware of the damage that peat extraction is doing to the environment. Peat forms in water logged conditions as the result of the decomposition, compression and accumulation of dead plant material such as sphagnum moss over thousands of years. Peat bogs provide a unique habitat for native plants and animals as well as a stopping off point for migrating birds. Peat bogs also provide a key scientific resource and an important “carbon sink” that are being destroyed by extraction of the peat in part so that leisure gardeners can enjoy their hoppy using a relatively new material rather than the traditional soil based composts or modern alternatives. Peat is used in the garden as a mulch, soil improver and growing media. Peat makes relatively poor mulch as it breaks down relatively quickly and in dry windy conditions tends to blow away. Bark, Leaf mould, recycled wood waste, spent mushroom compost and garden compost makes all make better mulches. While peat based composts will improve the soil condition nearly the entire peat alternatives do a better job. 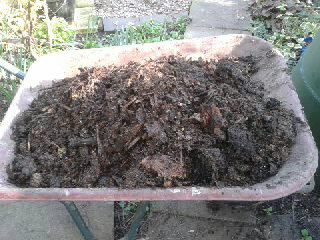 Once again garden compost, wood waste, spent mushroom compost, leaf mould and farmyard manure are excellent alternatives. In the UK, about 96% of horticultural peat is used in growing media. It is true that many peat free composts left much to be desired but there are now acceptable peat based potting composts and seed composts are improving. My appeal is that peat based products are avoided where possible and where the peatfree alternatives are not quite as effective as the current peat based products e.g. seed composts, consideration given to using soil based seed composts while monitoring the progress with peat free alternatives. Coconut fibre (coir) is the outside husk of coconut. It can be purchased as compressed ‘bricks’ which when soaked expand to form a loose, fibrous potting medium. It has good water retention and can be mixed with garden compost. Monty Don (http://www.theguardian.com/lifeandstyle/2002/mar/17/gardens) writes that it is not necessary to add anything to Coir if it is to be used purely to raise seedlings but for potting or potting on he recommends the following mix: 3 parts coir, 1 part sieved garden compost, 1 part sieved loam and 1 part sharps and perlite or horticultural grit. The RHS indicate that autumn collected dead bracken cam be composted using the same method as leaves to produce leaf mould (http:www.rhs.org.uk/advice/profile?pid=445). Green waste compost is a peat-free organic soil improver made from garden waste collected by local councils. Where the green waste is not separated from the general rubbish it is would be sent to landfill. In addition to its use as a soil improver at 20-40 litres per square metre (equivalent to a 2-4cm layer) it can be used to line planting trenches for fruit and vegetables, as an addition to the soil when planting out, to top dress lawns and as a component of a peat free growing medium when transplanting seedlings .